Philadelphia 76ers guard Jimmy Butler dunks during the second half against the Orlando Magic. 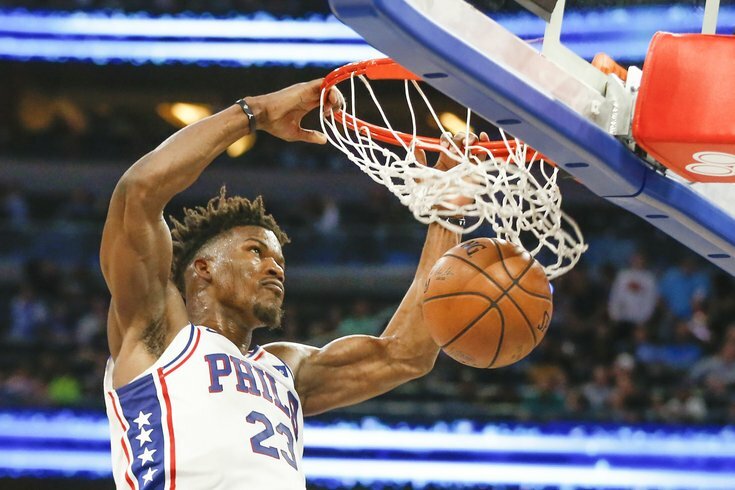 The early returns on the Sixers' blockbuster trade for Jimmy Butler have been overwhelmingly positive, including Saturday's overtime game-winner against the pesky Charlotte Hornets. Most of the concerns about Philadelphia's new star have centered on whether his personality will mesh with his younger Sixers co-stars in Joel Embiid and Ben Simmons. Early on, the most encouraging sign has been Butler's friendship with JJ Redick, who dared his new teammate to take the final shot against Charlotte. "JJ walked on and said, 'I bet you won't call game on this one.' I had to listen to him, man," Butler said. "I'm confident in the shots that I take, but that one, I'm glad that I made it." While Butler could be a legend in the making in Philadelphia, the last franchise superstar to grace the court for the Sixers is bullish on the team's new look. Allen Iverson, who recently revealed his hilarious first interaction with Michael Jordan, caught up with The Athletic's Shams Charania to discuss the impact the trade will have on the organization. "We got through so much — excuse my French — s*** to get to this point," Iverson said. "Been through so much s***. We're here. We got a great player in Jimmy. We'll miss those guys (Robert Covington and Dario Saric), but adding Jimmy was just beautiful for our team." Iverson compared the buzz surrounding the trade to the excitment Philadelphia felt when he led the Sixers to the NBA finals in 2001. Looking at the roster, he feels confident the current team is constructed for a run, too. The Sixers take on the Phoenix Suns on Monday night at the Wells Fargo Center, where they have yet to lose a game this season.